It’s been a while! I have now come out of my hole and I’m proud to say that Mal and Chad Volume 3: Belly Flop! is finished. It is the best book I’ve ever made. Recently, Scott King interviewed me for the cartooning class he’s teaching at UMES, asking me some questions on behalf of the students. 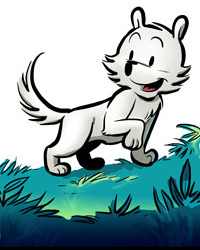 Scott King is not just a teacher of the craft, but also a writer of various comics projects, most notably a webcomic called Holiday Wars. Be sure to check it out! 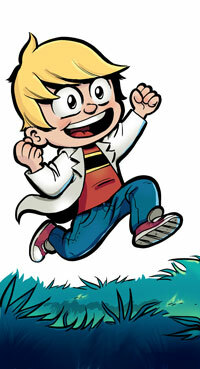 Here’s a screen shot from a page from Mal and Chad book 3: Belly Flop! that I’m proud of. In this book, I’m trying to up the detail and care I put into each page. Mal and Chad Color Cover! 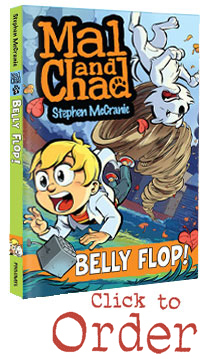 Last week we saw the inked version of the cover of the third Mal and Chad book: Belly Flop! This week I present to you the final, colored version. I’m pretty bad at working with color, so, like the last cover, it took a lot of iterations to finally get the right color scheme. Last week, I showed you all the iterations I went through to finally arrive at this cover design for my third book, entitled Mal and Chad: Belly Flop! This week, I wanted to show you guys what my cover sketch looked like once I inked it! Hey friends– I wanted to share with you my process for drawing the cover of my next book– the title of which will be, Mal and Chad: Belly Flop! Hey all! I’ve been working hard on the third book recently, and guess what? I finished all the thumbnails for the book! Hey everyone, check out this amazing costume that 7 year old Mal and Chad fan Kurt Parker made! What would you put in these blank speech bubbles? We are currently running a contest to see who can think up the best lines for Mal and Chad to be saying! Click here for more details! This Friday through Sunday is the annual Albuquerque Comicon! I’m excited to announce that I’ll be there, and even though Mal and Chad book 2: FOOD FIGHT won’t be out in book stores until the nineteenth, I WILL have pre-release copies of the book for sale!